This is where artist Jamie Williams Grossman plays with paper, paint and ideas, and showcases her art journals and sketchbooks. 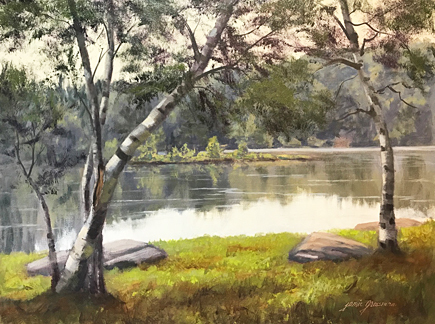 To see her paintings, please visit Hudson Valley Painter. It's so much fun to have these large pages that open flat to be able to spread out and sketch across a large expanse of paper. Since I have this extra heavyweight (180lb.) prototype book, I've been doing some sketches in acrylic too. Why be limited?! 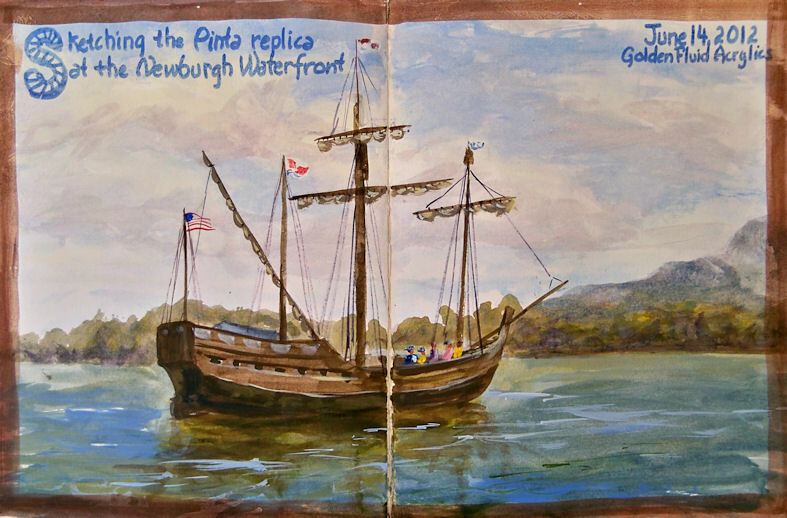 The Nina and Pinta replica ships docked in Newburgh, and a number of us from Lower Hudson Valley Plein Air Painters went to sketch them. To our dismay, they were way out on a private marina dock, almost completely blocked from view by yachts in front of them. 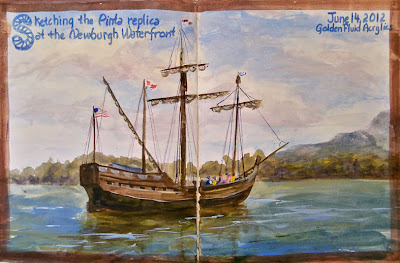 A restaurant next to the marina, Bill Joe's Ribworks, came to our rescue and allowed us to paint and sketch from their beautiful property, which had a perfect view of the Pinta. Bonus: We all treated ourselves to a fabulous lunch there! Be sure to check it out if you ever find yourself along the Hudson Riverfront in Newburgh. When I closed the book, the paint in the gutter of the book was still a little damp, which is why it stuck together a bit as you can see in the center of the sketch. This book is really amazing for multi-media work and wet washes. It doesn't move at all! Please see the "About Me" page on my website, Hudson Valley Painter. Nomadic PE-07 Pencil Pouch Review --- Peek inside my sketch kit!